Every year I do one big trip to go to various baseball stadiums (and sometimes soccer). This year the trip had four different possible paths. The first was a possible trip down through Florida which would start at Jacksonville, then go through teams in the Florida State League, and at least one MLB game. That one bit the dust the moment thee Jacksonville Suns changed their name to the Jacksonville Jumbo Shrimp. That kind of bad behavior cannot be condoned. The next trip considered was one which would have have run me through the Northeast picking up the Bisons, Lake Monsters, Paw Sox, and the Revolution (soccer). I liked this one, but the daily drive was going to be substantial and, y'know, it's the Northeast. I might run into Yankees. The one which was the front runner for the longest time was the Western trip. It involved a trip that started in St. Louis, took in all the teams in Missouri, Nebraska, and Kansas, and took a detour through Oklahoma to pick up teams in Oklahoma City and Witchita. I went back and forth on this one for a while. It was the one in which I could fit the most teams, I would have gotten to see a Pecos League team, it had the most teams I was actually interested in seeing, and I would have been able to see the Evansville Otters on the way back. The biggest drawback to this trip was that there was going to be a lot of time spent driving to get to the start and several days with 6+ hour drives. When I realized I'd made an error (or one of the teams changed a start time) this trip got scrambled a little and I couldn't get as many games in as I'd hoped and I was not going to be able to go to an Otters game. Sadly, this one finally dropped off my radar. In the end, the trip this year will be a Northern one. In Pennsylvania I'll be stopping to watch the Washington Wild Things, the Pirates, and the Erie Sea Wolves. In Ohio I will be attending the Akron Rubber Ducks, the Lake Erie Crushers, the Mahong Valley Scrappers, the Indians, and the Lake County Captains. Finally, on the way back I will pick up the West Virginia Black Bears and the Bluefield Blue Jays. It should be an interesting trip. Next year the goal will to be to include one of the following three teams: the Oklahoma City Dodgers, the Saint Paul Saints, or the Buffalo Bison. The Indians are a storied team who have been around forever and beloved by the locals. That's the big plus which drew me to Indianapolis to watch them. The thing which almost drove me away was the downtown location and the crummy seat they sold me. 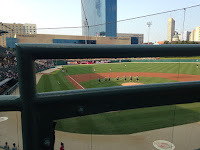 It's a beautiful stadium located in downtown Indianapolis which was easy enough to get to. However, it does not have parking allocated for it. I drove a circle around it three times before realizing there was parking across the street and then went one more go around because I couldn't get over to turn off. Then I parked and had to stand in line for an automated computer pay system which everyone had to figure out because no one seemed to ever have used it before. Then I went across the street and into the stadium. It was a nice enough stadium, but I didn't get a really good seat because the Indians' online site refused to sell me anything decent on the lower level (plenty of empty seats down there). So, I had a front row seat on the upper level - with a double bar right in front of my face which interfered with any view I had of the field. Joy. I can't say it's the first time a sports team has sold me a ticket that it shouldn't have because the view was obscured (I'm looking at you Cincinnati Reds and Huntsville Havoc), but that doesn't mean any team which sells this sort of ticket isn't acting in bad faith. 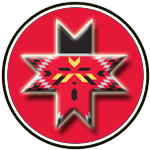 The Indians have an interesting logo which I spent a while trying to figure out before I gave up and went to the internet via my phone. It turns out that in an attempt to retain their traditional name, but have a logo that is not offensive to anyone, they created this thing that nobody recognizes as anything unless it's explained to them. It's a sort of pretty logo, but since all it looks like is part of a quilt, it's utterly useless as an identifier. I bought a hat with it, but rarely wear it because it looks so strange. 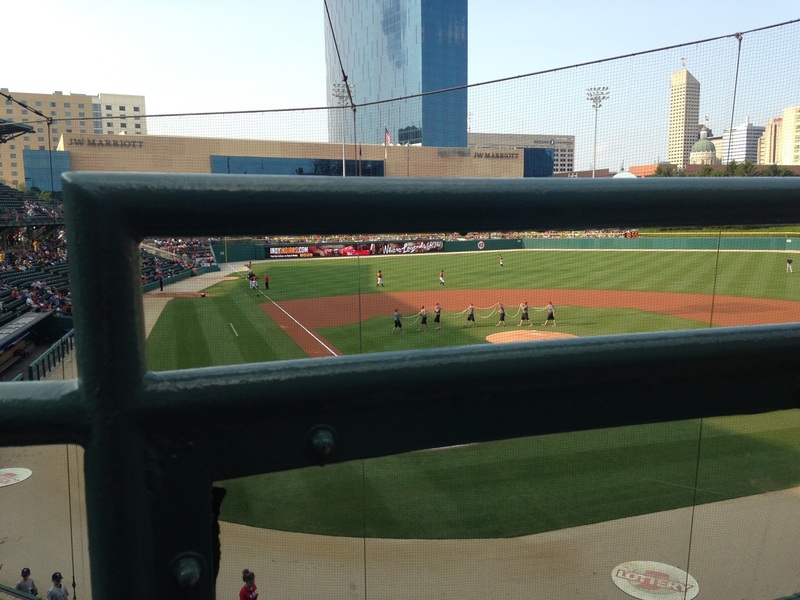 All-in-all, Indianapolis has been the most disappointing of the teams on my "must see" list. It's not bad per se and I'm sure if I was local and knew where to park and where not to buy tickets the experience would have been better. The confusing, strange logo doesn't help either. I guess my review of the entire experience could be summed up with one word: meh.